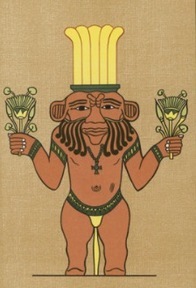 Depicted as a beared dwarf facing forward with a lion like main, sometimes a tail and frightening features. Sometimes he is weilding two blades or has a plumed crown. God of newborn babies/ children, pleasure, household/ family, fertility, healing, pregnant women, and war. Figures were kept in the house or amulates with his face were worn for all around protection. He was known for scarign away demons from the house becuase of his face facing forward he was seen as frighting to evil. He was also know for killing snakes. He also is know for music, dancing and sexual pleasure. Tattoes have been found in the NK of him on the thighs of dancer, musicians, sacred prostitues, and servant girls. He was depicted on magic wands, cosmetics, furnature and mirrors. He was known for making children laugh and it was said to be Bes making funny faces if a baby laughed for no reason. HAy ㇉ㄿ㇌ひ, ㇉ㄿ㇌, ㇉ㄿ㇌〭 -- dwarf ?